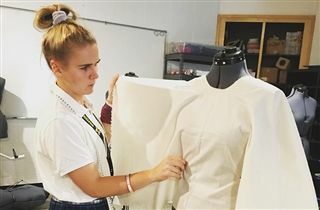 Congratulations to Fashion Design students Megan Read, Molly Ensor, and Katie Ensor, whose designs were accepted for the KMAC Couture Fashion Show. Only 50 designers were chosen out of 112 submissions for the show, and applicants ranged from high school students to adults. These students have all taken Fashion Design classes with Danielle Brown. In addition, freshman Ala Durham was accepted to present her design at the cocktail hour show before the runway show. KCD is the only high school in Kentucky to have a 100% acceptance rate for this show this year, and this is a big honor for these students. Way to go, Bearcats!